Kelim is a range of hand-woven chenille and cotton mix traditional rugs. The rugs feature authentic tribal designs that stood the test of time, in addition the rugs further feature braided edges and tassels for an all comprehensive authentic look. 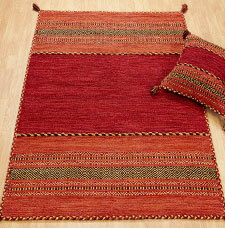 Last but not least, the Kelim rugs are offered at an excellent value.